Welcome to "The Techies" home page for the 2002 Tech Challenge. This year, our objective is to build a device which will move an olympic torch (well, actually a PVC pipe) from one pedestal to another. Our team is Greg, Kenneth, Michael and Rigel, all 8th graders from JLS Middle School. 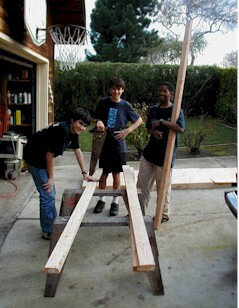 The boys start by fabricating the test track for the device they will design..
Mike and Greg, master carpenters. Oops. Poring over the plans, they discover this isn't the case! For now, we are using inverted paint buckets as pedastals.